18 Wheels of Steel: Extreme Trucker Game Review - Download and Play Free Version! Take on the Most Extreme Trucking Routes Ever! Extreme locations for truck driving like northern Canada and Australia. An assortment of vehicles to drive like snow plows and semi trucks. Unlock new missions and locations. Experience the Most Extreme Trucking Jobs! Are you daring enough to go where no trucker wants to go? Haul dangerously oversized and high risk cargo through Australia's scorching heat, Alaska's deadly ice and Bolivia's dangerous mountains! 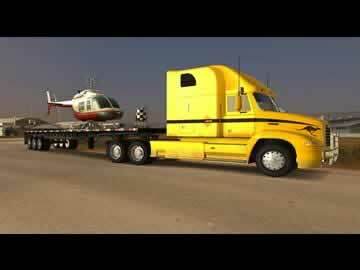 Can you get your cargo to its destination on time? Or will you die trying? Deal With Obstacles, Huge Cargo and More! Choose a mission and hit the road! Don't forget to watch your fuel level and keep your truck in good shape. If you deliver your load intact and on time then you'll earn points. The more points you earn the more maps you unlock. But it's not that simple! Face obstacles like thin ice, overturned trucks in the road, debris and more. 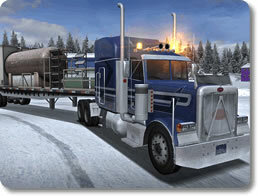 Earn new trucks like a road train of four or more trailers, and carry unique massive loads like mining equipment. If you're looking for a thrill, this is it! Feel your adrenaline rush as your truck slides over ice or you barely miss an oncoming truck. Experience the excitement of this dangerous job and with such great graphics and effects every bump will feel real! Can you handle the most extreme trucking jobs? Challenge yourself now with 18 Wheels of Steel: Extreme Trucker! Extreme Trucker deviates from the standard styling of the 18 Wheels of Steel(18 WOS) series. In this edition the free play has been exchanged for mission based play in varying climates and countries. Typically your goal is to carry your load to its destination as fast as possible and as safely as possible. Environments like Tuktoyaktuk Winter Road are the norm in 18 WOS: Extreme Trucker. Gameplay consists of missions in the three locations. Each mission will present its own unique challenges. Some missions are longer than others or have loads that are harder to haul without accidents. Each time you pick a mission it will be in a different truck than the previous mission. Driving a semi truck isn't the only option though, you can also drive things like snow plows. Even though you might be driving a snowplow the goal is always to deliver something, not to plow roads. As you complete missions you will be awarded points. The missions have a maximum point award and you lose points for taking too long or damaging the load. Points level up your driving skill level and unlock new missions and eventually new locations. There are three areas to drive in: northern Canada, South America and Australia. In northern Canada you have to navigate the frozen conditions of the Tuktoyaktuk Winter Road. South America puts you on the Yungas Road, commonly referred to as the road of death. Finally, you get to experience driving through the Australian Outback. Each features unique challenges like driving a road train through the Outback. A road train is hauling multiple trailers, up to five at once. All these areas keep the scenery changing so you don't get too bored with one area. The work put into the graphics really shows through in this edition of 18 WOS. Each area is beautifully detailed and reflects what they are in real life down to the wildlife that inhabits the area. The trees, roads, and animals make it feel like you are really there experiencing the travels. The sound track adds to this feeling by including the sounds of the vehicles around you. In Canada helicopters can be heard buzzing overhead. While this game is very well detailed graphically, it lack that same attention to detail in the game physics. An example of this would be while driving in Canada. It is possible to take sharp corners, on ice, at speeds up to 60 mph without any sliding. Further, your vehicle handles and drives the same off the road as it does on. This does not suit the simulation style gameplay. Another drawback to this game is the lack of a free play mode for exploring. 18 WOS: Extreme Trucker lets you experience what it's like to drive on the icy roads of northern Canada and the hot, dry roads of the Australian Outback. While this game lacks a free play mode the abundance of missions will keep you entertained. With three locations to choose from you won't ever get tired of seeing the “same old things”. This game provides a new experience for 18 WOS fans and newcomers alike.